FWO's long, Chorale concert dresses were designed with modesty in mind. The front and back scoop neckline is shallow enough to ensure that a traditional bra can be worn without fear of showing the band or the straps. 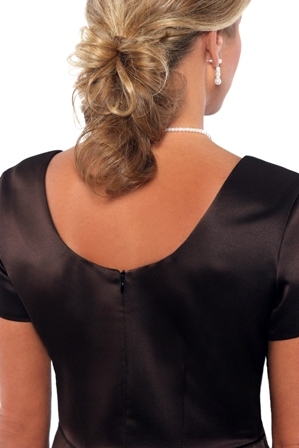 This short sleeved choir or orchestra gown is made in our washable, non-stretch satin. Back zipper. For younger performers, see our Youth Chorale dress. It is available in all of the Adult Chorale color options. FWO Extras: Because of the design of the empire waist, this style can easily be used for a Maternity dress. Plus, it comes in a wide variety of colors, great for bridesmaids! Call us for more information.